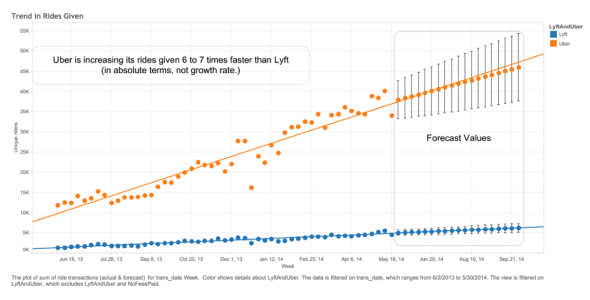 Uber vs. Lyft: FutureAdvisor study compares revenue, users, growth at the companies. Have Uber and Lyft depleted their U.S. markets? Lyft in recent months has accomplished a tremendous feat. Once an afterthought—if a thought at all— in discussions of ride-sharing services, the company has worked its way into practically every conversation about the industry alongside its rival, Uber. This is all the more impressive considering that Uber dwarfs Lyft by just about every measure. Lyft’s $700 million valuation is tiny compared with Uber’s $18.2 billion estimate. Lyft operates in fewer places than Uber in the U.S. Abroad, it has no foothold, while Uber runs in 45 countries around the world. To shed more light onto how the two stack up in the U.S. specifically, FutureAdvisor, an online investment management site, examined the purchases of 3.8 million of America’s active credit and debit card users. From that sample, FutureAdvisor identified more than 96,000 customers who spent a combined $28.6 million on the two services between June 2013 and May 2014. In that period, more than 82,000 people used Uber, while only about 14,200 employed Lyft. Uber facilitated seven times as many rides as Lyft did and its trips on average were also more expensive. Lyft is growing slightly faster than Uber month-over-month, but Uber is adding more customers, more rides, and more revenue than Lyft in absolute terms. For both riders and weekly revenue, the upward slope of the orange Uber trend line is greater and faster than that of the blue Lyft trend line. 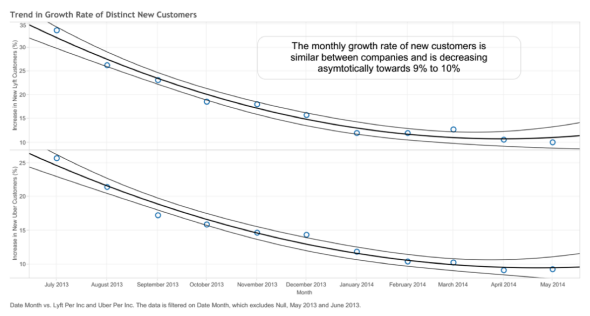 On the other hand, when it comes to the rate of growth of new customers in the U.S., both companies are slowing. What was once monthly growth of 15 to 30 percent appears to be leveling out at 9 or maybe 10 percent. That’s still fast for corporate America, but less groundbreaking for Silicon Valley. 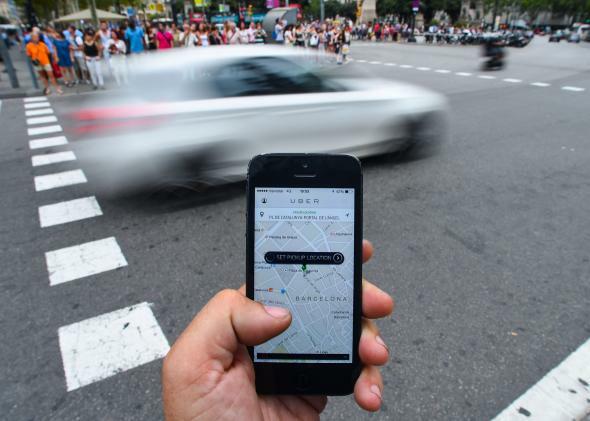 Chris Nicholson, a spokesman for FutureAdvisor, said the decreasing growth rates of new customers help explain why competition between Uber and Lyft is so fierce. “They both feel that the only way to maintain their growth rate in the U.S. is to grab each other’s market share,” he says. If that’s the case, the data suggests that Uber is so far doing a better job at getting ahold of its competitor’s riders. Of the total riders examined in the set, about 2,400 had used both Uber and Lyft. FutureAdvisor frames this fact as “only 2.5 percent of all riders used both services during the period studied.” Put like this, that seems to indicate very little overlap. But using the rider counts FutureAdvisor gives for Uber and Lyft it can also be phrased like this: 3 percent of Uber riders have also used Lyft, while 17 percent of Lyft riders have also used Uber. There are a couple of potential explanations for this discrepancy. Because Uber operates in more U.S. cities than Lyft, some of its customers simply don’t have Lyft as a choice. On the flip side of that, because Lyft is almost always competing against Uber, its customers are more likely to have a choice between the two services and opt for whatever happens to be cheapest and most convenient. That 17 percent figure seems to support what Farhad Manjoo argued a few weeks ago: Lyft and Uber are becoming indistinguishable commodities. But is it fair to say that the services have so tapped out their ridership in the U.S. that they need to steal each other’s users? That’s less clear. Sure, Uber is in more than 90 U.S. cities and Lyft in nearly 70, but those are the low-hanging fruit. People in metropolises are likely to embrace Uber and Lyft as a convenient taxi alternative. But the true goal and value potential of ride-sharing services is to convert people who have no need for taxis from car-owners to Uber and Lyft users—and that market isn’t saturated yet. Then again, it’s probably easier for Uber to head to new cities overseas and battle Lyft for its share of the lucrative U.S. urban landscape than to try changing the lifestyle habits of non-city-dwelling Americans.